I'm a sucker for theme parties. Who doesn't love an excuse to put together a new outfit or bake a unique dish to share with friends and family? 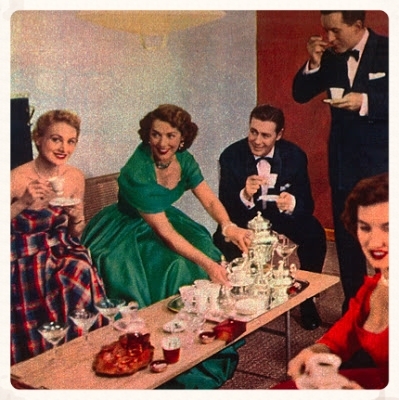 A mid-century modern dinner party not only has the potential for fun, but can be done inexpensively as well. Just a few funky, vintage finds can help set the vibe for your mid-mod party. Vintage shops and thrift stores can carry all kinds of unique retro pieces, and you only need a few strategic items to pull it off. Maybe a fondue set and retro bowl for dipping? Or a mid-century inspired brunch featuring a mod coffee carafe and matching tea cups? The possibilities are endless. Teak cheese tray with glass lid. Teak, walnut, and rosewood were all popular during the era because of their warm colors. So throw on your favorite Mad Men-inspired clothing, invite your friends over for deviled eggs, chicken croquettes, and chiffon pie. You're sure to have a memorable evening!